It’s the holiday season, and one of the perennial favorites is that iconic 1946 Frank Capra film, “It’s a Wonderful Life” – the story of George Bailey and of Clarence Odbody, his guardian angel. George, like many of us, doesn’t realize the tremendous impact he has on the lives he touches, until, when he’s in his darkest moment, considering chucking it all after experiencing a rather unfortunate series of downturns, Clarence enters and shows him what life would be like in his hometown were he never born. Obviously there’s more to the story than that, but that’s a good starting point for Tabard Theatre Company’s current production, “It’s a Wonderful Life”. The adaptation by Joe Landry takes the familiar story, and tells it as a radio play broadcast from studio WBFR, on 24 December 1946. Tabard’s Executive Director, Cathy Spielberger Cassetta has assembled an able cast including Karen DeHart, Craig S. Engen, Kurt Gravenhorst, Jeremy Harris, Jason Minsky, Ron Packard, Steve Schneickert, Irene Trapp, and Christine Wait for this production. The nine of them step into their New York studio, and fill the shoes of all of the familiar characters back in Bedford Falls, but we’ll return to them shortly. The set is cozy, the stage painted to match the rest of the theatre such that the entire space becomes that radio studio, including the audience. After all, a live radio show would often have a studio audience in house as they go on air. And since it is Christmas Eve, the studio is decorated with all the trimmings including a nicely appointed Christmas tree upstage center. The baby grand sits stage right, the Foley table sits stage left, and several standing microphones are downstage just as they would be in that period. The obligatory “applause” signs cue the audience at key moments (although in truth, a spontaneous burst of applause would be forthcoming even without the cues). There’s also a functional “on air” sign above the Foley table. Sound effect creators Shirley Benson and J.M. Perchalski hold a preshow demonstration to introduce the audience to magic of radio sound effects prior to Cassetta’s curtain speech and cast entrance. As they explain various samples, such as a metal sheet for thunder, or a belt snapped for a slap, volunteers are pulled from the house to try them out which is great fun, so do get there early. Although effective, on opening night, Benson’s and Perchalski’s microphones kept turning on and off causing portions of their descriptions to go unheard, particularly when competing with the sounds of some audience members talking and finding their seats closer to curtain time. 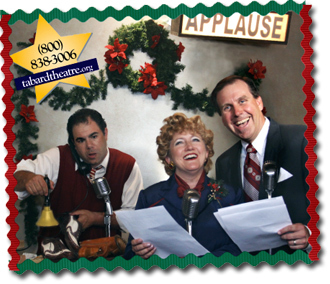 The cast members enter the studio as radio show personalities might prior to going on air for a holiday show, mingling a bit with the audience, greeting one another, and bringing presents to put under the studio’s tree. While Harris is the music director and pianist, Packard’s character plays George Bailey within the radio play, Minsky is the aptly named Foley artist and radio studio manager, and DeHart plays Mary Bailey, the rest assume multiple roles within the radio play, so all “radio actor” names get lost in the mix and aren’t listed here, though they are in the program. Harris composed the music he plays throughout the show which consists of underscoring highlighting scene changes, mood shifts, and dramatic moments that one would expect in a radio show. He also includes a couple of commercial jingles sung to the tunes of “Rudolf the Red Nosed Reindeer” and “Santa Claus is Coming to Town”, each performed by the majority of the cast, with product props as would be expected to keep the studio audience engaged. A bit arcane by 2011 standards, they charmingly hearken back to the period. Minsky is a busy fellow keeping up with all the sound effects. While they are far too numerous to demonstrate completely during preshow, the program provides a fairly comprehensive list, and the audience can see precisely what he’s doing the entire time. His considerable skill and precision are admirable as he matches his sound effects to the actors’ dialog and actions. Being a radio play, the actors have their scripts in hand for the “story” akin to a staged reading, and some of them find this more difficult than performing in the standard way off book. This occasionally causes a few missteps in line delivery because they have to sometimes slow down to read the lines (or at least appear to) rather than run completely from memory. The scripts are not held for their entrances as “themselves” or during the radio commercials which are performed with choreography. Gravenhorst, like most of his castmates, plays multiple roles with very different voices, some accented, some not. Unlike most of them though, he uses props including a hat and/or cigar for some of them. Two of his most prominent characters are Clarence and Potter, the villain. It’s fascinating to watch him transform as he deftly turns around drawing on different props to help him change demeanor and personality instantaneously, save for one or two slight hesitations. Gravenhorst, Schneickert, Wait, and Trapp all become the young Bailey children at various points and play closer to their actual ages at others. Being radio, the voices are all important, and their vocalizations match their characters remarkably well. Trapp in particular is adorable as the young Zuzu. Engen serves as narrator most of the time reminiscent of Alistair Cooke in some ways, but he also takes on several other minor characters seamlessly transitioning between them. Packard and DeHart spend a fair amount of time in that nether land, halfway between a strict radio broadcast where actions don’t matter, and relating to one another rather credibly as George and Mary. They have a tendency to face one another in discussion, and appear to have to fight the urge to enter a full embrace at one point in the story. In fact, Cassetta has staged the entire production with more physicality than would normally be present in a pure radio broadcast because the show is playing to a modern theatre audience accustomed to actors engaging them visually. To this end, although the cast members never leave the stage, when they are not in a particular scene in the radio play, they move upstage and partake of activities an actor might while waiting to go on. Their activities read much like they would in a theatre greenroom sans food and audible discussion down to DeHart knitting and then seemingly throwing away her gum on her way to the standing mikes for her next scene. The show isn’t perfect, but the blemishes are minor. There are sound issues with mike adjustment and some popping in some of the more punctuated scenes. Also, the greetings at the start of Act 2 don’t read authentically. They are already in the studio, they wouldn’t greet one another again the way they would when first arriving that day. In all though, Tabard’s “It’s a Wonderful Life” is a unique and delightful evening’s entertainment that puts a slightly different turn on the familiar holiday story. The show continues at Theatre on San Pedro Square Fridays through Sundays through 18 December. See www.tabardtheatre.org or call 800-838-3006 for more information or to buy tickets.